As in Alexander. Just found this genius sweater on Andrea's blog. She is the owner of Fable Handknit. Anyway, that sweater is gorgeous - the color, the scale, the simplicity. I might have to work out something similar for myself. But then that would be the end of the bulky sweaters, as the Regal Alpaca is also on the bulky/heavy worsted side. And it's almost done! I finished knitting the sleeve and did up all the seams last night, while watching Terminator 3. In case you didn't already know, it's awful! I enjoy the occasional sci-fi/action/adventure movie, thought the first two T movies were pretty good (loved Linda Hamilton's biceps in T2), and I like Claire Danes. But this was filled with expensive explosions and baaaad acting. Wow. But that was good for finishing work. Now I just have to sew in the sleeves (eep) and figure out how I want to fasten the fronts. I'm dreaming of ribbon bows in some floppy, scrummy, ombre silk, which is probably impractical. Oh, and then I have to crochet around the edges. I think I get the single crochet thing, having watched a couple of Knitty Gritty episodes lately that used it. But then you're supposed to do a row of "crab stitch", which is, apparently, backwards single crochet (!). Guess I'll be googling that one. In yarn acquisition news, the yarn buyers group I belong to is doing a group buy of 100purewool yarn. They have merino worsted (similar to Mmmalabrigo according to some) and merino laceweight. But I'm not as wild about the colors as, say, Handpaintedyarn/Malabrigo. But the laceweight merino seems to have disappeared from HPY's site, so I'm guessing Malabrigo will have that line soon. And 100pw's site is tough to navigate and get a good idea of the colors without clicking fifteen times. That makes me crazy! But why am I cooing over lace yarn anyway? Am I a shawl type of person? It must be the artsy me. 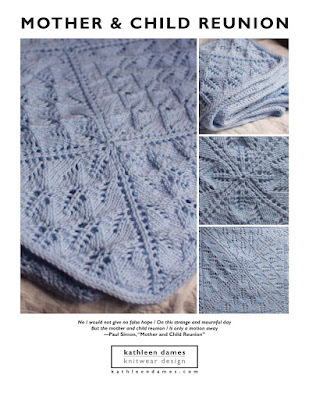 So, what pattern would I do: Eunny's Print o' the Wave Stole, Anne'sWing o' the Moth Shawl, Polly's Kiri, Stephanie's Snowdrop Shawl? And those are just the free ones (oops, Anne's isn't free, but that's OK). Then there's Victorian Lace Today, which seems to have taken parts of the knitting world by storm. Carolyn is slip slip... I am Jill, but I don't see our comments on your site. Anyway... We have the crab stitch apttern at the shop! I know, because I am a Fighting Sandcrab, that was my HS mascot in Port Lavaca, Texas. Got crabs? Oh dear.